Sometimes you will want an activity to recur on a regular basis (this is when an occurrence becomes a series, if you remember). This might be true of a variety of activity types – for example, you may want to schedule a weekly staff meeting, but you don't want to have to create a new activity every single week. Scheduling a recurring activity allows you to set up your activity so it will automatically appear week after week and remind you and your staff that it's upcoming. Scheduling recurring activities can be a great time saver and really take a load off your mind! 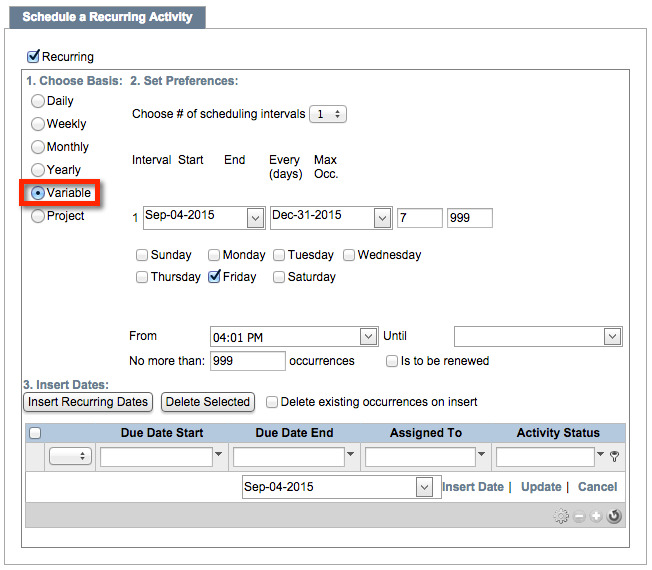 At the bottom of the New activity screen, click on Schedule a recurring activity. This will bring up a screen to the right with a check box that says recurring. Click that, and it will open the Schedule a recurring activity screen. Under Choose basis, decide how frequently you would like this activity to be repeated. Each option has its own unique set of variables. Daily: Repeat every X number of days, or pick the default every weekday. Choose a start and end date (if applicable) as well as start and end times. Set the number of recurrences you wish to have happen (to a maximum of 999, depending upon your date range), and designate the recurrences to be renewed if applicable. 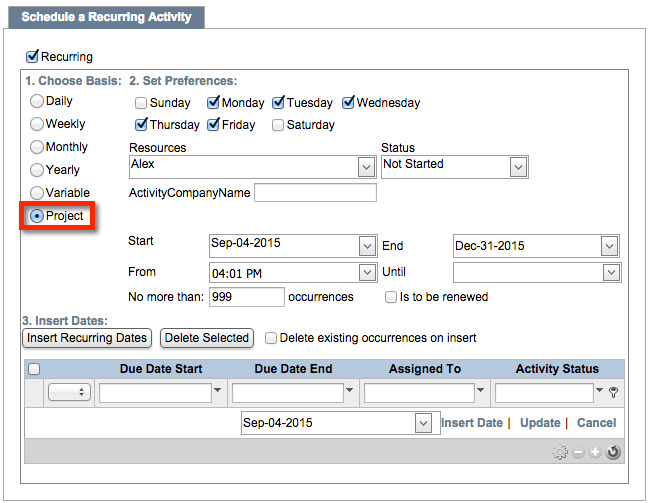 Click on Insert recurring dates to bring up a new grid that can be filtered (see filtering grids). 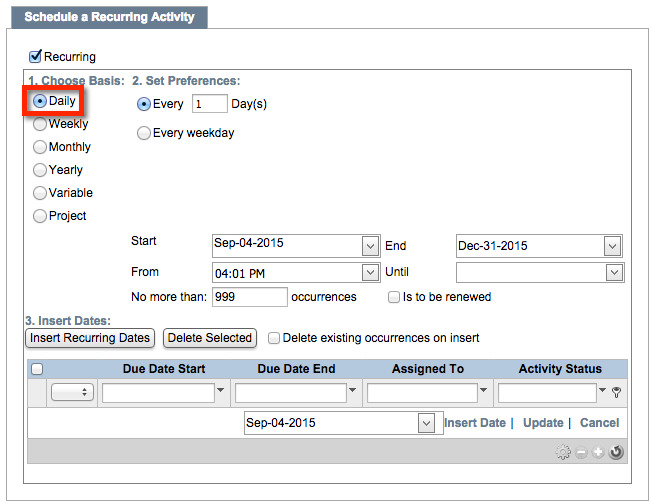 Insert new recurring dates (from the dropdown calendar below the grid), delete existing entries, and choose to automatically delete existing occurrences in the series when new ones are added. This is important if you expect to have a lot of occurrences as it helps to keep your grid organized! Click Update to refresh the grid with your newly-inserted information. This grid functions the same way for all Choose Basis options. Weekly: Repeat every X number of weeks, or pick the day of the week to repeat. Choose a start and end date (if applicable) and start/end times. Set the number of recurrences (maximum of 999), and designate the recurrences to be renewed if applicable. Monthly: Repeat on X day of month Y (for example, the 27th of every 2nd month), or choose from the default dropdown lists and set the recurrence for the first, second, third, fourth, or last Sunday through to Saturday of each month (for example, the third Wednesday of every 2 months). Choose a start and end date (if applicable) as well as start/end times. 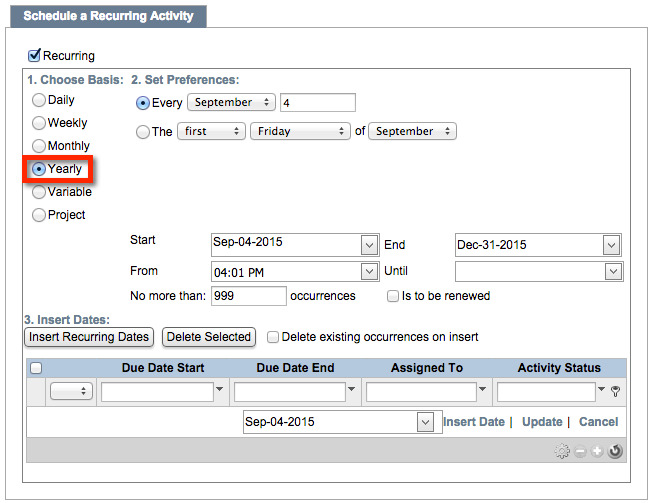 Set the number of recurrences (maximum of 999), and designate the recurrences to be renewed if applicable. Yearly: Repeat on X day of month Y every year (for example, every 27th of May), or choose from the default drop downlists and set the recurrence for first, second, third, fourth, or last Sunday through to Saturday of a given month (for example, the fourth Tuesday of every May). Choose a start and end date (if applicable) and start/end times. Set the number of recurrences (maximum of 999), and designate the recurrences to be renewed if applicable. Variable: Choose up to six scheduling intervals, a start/end and time for each, the recurrence frequency (every X days), the maximum occurrences (up to 999), and the day you wish the recurrence to happen (Sunday through to Saturday). As with the other options, you can set these recurrences to be renewed. Project: Base an occurrence on an existing project. 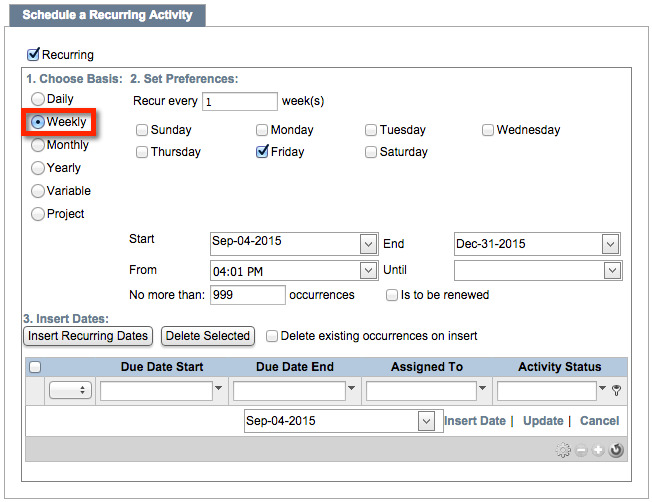 Choose the recurring days of the week by clicking one or more of the associated boxes. Resources default to the current user, but you can reassign this to other users using the dropdown list. Status is defaulted to Not Started; change this using the associated dropdown list. The ActivityCompanyName field refers to the company name associated with the related Contact. Choose a start/end date and times. 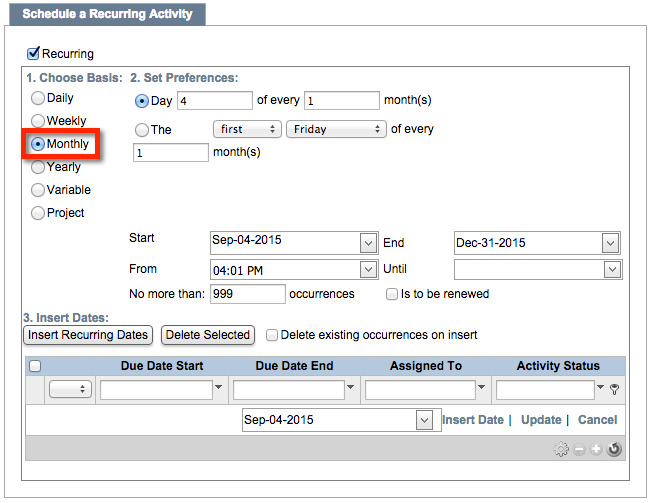 Set the number of recurrences (maximum of 999), and designate the recurrences to be renewed if applicable. Once you have chosen your Choose basis preferences, click Update to save your new occurrences both in your Activities list and in your Calendar.